In earlier posts we discussed how the simplicity of hammer mill technology lends itself well to many applications. On occasion though we encounter an application where the hammer mill is not only effective, it far exceeds the industry standard. E-scrap processing is one of those areas. Traditionally, whether the goal is data destruction, recycling of materials - or both, e-scrap has been processed in large industrial shredders. Shredders process the e-scrap by using a shearing action that cuts the material as it passes through claw-like knives. While this is method is effective, drawbacks include frequent maintenance to replace the shredder knives, and the costly price point of the standard industrial shredder. Hammer mills process material with a pulverizing action. Rectangular steel hammers are attached to a shaft inside of a steel grinding chamber. As the shaft spins, the hammers flail out, bringing them into contact with the material being processed. A combination of hammer blows, particle on particle impact, and contact with the mill interior, work in unison to reduce the material until it is able to pass through the screen or heavy bar grate covering the mill's discharge opening. 1. Flexibility - The simplicity of the hammer mill design offers great flexibility, making it suitable for processing a wide variety of e-scrap materials down to the exact desired finished particle size. Mill size, hammer style and configuration, and screen size are determined based on the processor's production goals. In fact, multiple types of e-scrap media can be processed in the same hammer mill, without reconfiguration. 2. 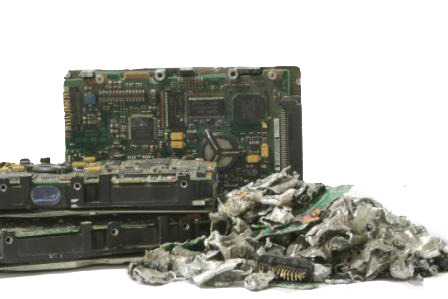 Complete Data Destruction - As it is pulverized, the e-scrap material is continuously scraped and scoured by the turbulent action within the mill. As a result, all retrievable data is destroyed. 3. 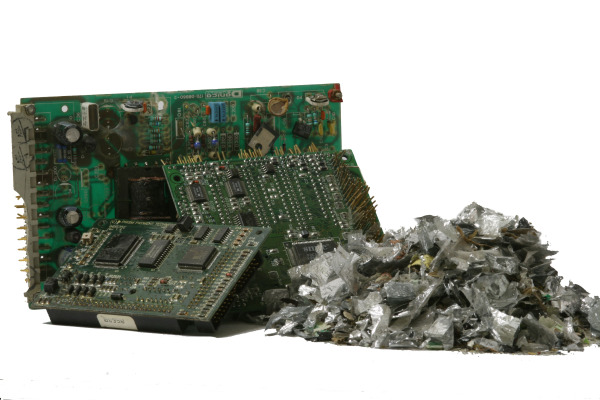 Liberation of Metals and Other Materials - The second benefit of the pulverizing process is that the hammering action breaks the e-scrap apart, liberating the metals and various other materials. Once broken apart, all pieces remain in the grinding chamber and continue to be pulverized until they are able to pass through the screen covering the mill's discharge opening. 4. Low Cost, High Production - Hammer mills are available in a range of sizes, and are highly customizable based on the material(s) being processed and the user's production goals. A mid-sized hammer mill configured for computer hard drives can process up to 2500 units per hour. A shredder with the same throughput capacity would cost roughly four times that of the hammer mill. 5. Minimal Maintenance - The knives of the shredder dull quickly, and in many cases must be changed monthly. In comparison, one set of 4-way reversible hammers will, on average, last up to one year.